The quality of the foam used in each of these layers — the core foam and the layers of memory foam — gives the mattress its unique feel and also determines the durability and longevity of that particular memory foam mattress. As always, you tend to get what you pay for — so the cheaper memory foam mattresses offer low density cores and memory foam, while the more expensive ones have higher density foams. While you might not notice this difference in quality if you just lay down on a memory foam mattress for a short time in a showroom, over time the difference is very apparent — the higher quality memory foam mattresses that we’ve tested get much higher ratings for comfort and test much better for durability. In addition, not all memory foams are created equal. That is, just because a memory foam is rated as 4 lb density (so a cubic foot of that memory foam would weight 4 lbs), doesn’t mean it is necessarily as comfortable as another memory foam made by a different manufacturer that is also rated as 4 lb density. In our tests with 6 different memory foam beds with very similar specs in terms of their foam’s density, the ratings were very different with one mattress getting much higher overall ratings as well as lower return rate. The memory foam used in this bed is made by a small, boutique foam manufacturer in the US that specializes in memory foam. And while it is more expensive than the other generic memory foams out there, it just gets higher ratings for comfort and overall sleep quality than any others we’ve looked at. That is why I only carry this particular mattress (our 10″ Memory Foam Mattress) and the toppers made with this high end memory foam — I just don’t feel comfortable carrying anything else. In addition, one thing people often overlook in evaluating a memory foam mattress is the quality of the “core” foam. And this is where a lot of memory foam beds cheap out, since people don’t understand the importance of having a high quality “core”. But this 5 – 6″ of “core” foam is critical since it provides the support for your body. 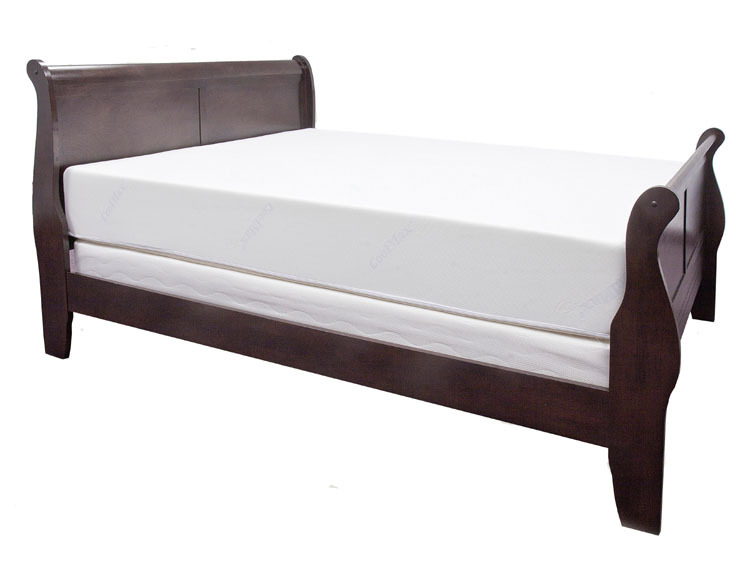 The memory foam gives a soft conforming feel to the top of the bed and also is very effective at reducing pressure points due to the unique way the memory foam cells spread pressure. But the core foam provides the support for your mattress, and having both a firm core and one that is a high overall density so that it will last is something I think is very important and mostly overlooked. Again, it costs more to use core foam that is higher in density, but it both will ensure that the bed last longer and also that you will get the support for your body over time. How can you get a quick read on the overall quality of a memory foam mattress — for the quality of the foams used in it? One easy way without getting all geeky on it is just to look at the overall weight of the mattress. Simply put, the heavier a memory foam mattress is, the higher the quality foam used. That is why our Queen 10″ Memory Foam Mattress comes in at almost 50% greater weight (or more) compared to most of the new bed in a box options that have popped up. And yes, our prices are higher than these lower weight/quality memory foam mattresses. But that is the trade off — again, you usually do get what you pay for. I see ours as an alternative for those looking at the high end memory foam mattress like Tempur-Pedic ™. Our memory foam mattress offers quality as high or higher than that found in these high end memory foam beds, but at a much lower cost since we sell direct to the public. Other aspects to a memory foam mattress that you might not have considered is the way the mattress tries to address one of the biggest complaints against memory foam mattresses — sleeping hot. I get questions on this all the time — does our memory foam mattress sleep hot? The basic problem is that standard memory foams, whose cells are not very open, tend to retain heat. So you sleep hot. But the latest generation of memory foams have much more open cell structures. The boutique memory foam we use, for example, improved air flow 95% and dissipates heat and moisture 3 times faster than standard memory foams. Unfortunately, this latest generation memory foam does cost more so isn’t something you find on most basic memory foam mattresses or bed in the box options. In addition, air flow can be addressed in the design of the layers of the bed as well as the cover. Our core foam uses an eggcrate top design to allow better airflow, and we have our core in two 3″ pieces each with an eggcrate top to maximize air flow in the mattress. And our cover utilizes the CoolMax(tm) fiber, which helps wick away your body’s moisture to allow you to sleep cooler. Other memory foam mattress don’t incorporate these type of design elements, so they may end up having real issues with their customers sleeping hot. As for ours, we get less than 1% of our customers having an issue with the our 10″ Memory Foam Mattress sleeping hot — so our overall focus on this issue from the selection of our boutique memory foam to the design elements of the bed have really eliminated the problem of sleeping hot. I hope that article has helped you understand better what goes into making a memory foam mattresses and the differences in quality and how they affect both overall comfort and durability. If you would like to find out more about our mattress, click here to learn more about our 10″ Memory Foam Mattress, which I believe in so much I offer an unmatched 365-day money back trial. Next Next post: What is the difference in memory foam density?